People of the greater Cleveland area, we get it. You miss LeBron and you're upset that he might win a championship. Noted. But that's no excuse to let wolfmen roam free. This young 20 year-old wolfman is likely especially spry, and he claims to have a military background. If you've ever played discount video games, you know that combination is a red flag. Lorain County Sheriffs deputies had received a call of a man acting angrily and becoming violent with campers and animals. When deputies arrived at the scene, according to the report, they found Stroup passed out in a trailer. Deputies say Stroup smelled of alcohol and when he was eventually were able to wake him up, he began growling at them. Stroup was placed under arrest for underage consumption and told authorities that he had blacked out from drinking too much vodka that evening. 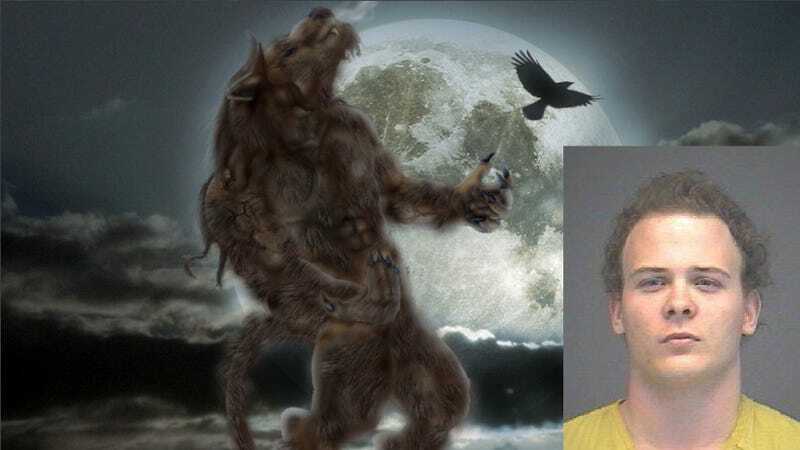 According to the report Stroup went on to say that ever since he was scratched by a wolf in Germany he blacks out when the moon comes out and goes on the attack. Deputies found Stroup passed out inside a trailer filled with knives, swords and other edged weapons, the report said. When Stroup awoke, at first he only growled at deputies. When he spoke, his words were slurred and in a thick Russian accent. He told a deputy he was going to kill the deputy's cousin Keith, but the deputy did not have a cousin named Keith, according to the report. Spooky, scary. Especially for you, Keith.